Along the Freedom Trail, just past King's Chapel at Old City Hall, is the statue of Josiah Quincy (1772-1864). Quincy was an author, educator, and politician. Josiah Quincy is best known for his work as Mayor of Boston from 1823 to 1828. He promoted what is now referred to as urban renewal or urban revitalization. He had great long term vision for this city. Quincy was greatly responsible for reclaiming the tidal land in front of Faneuil Hall, to about Atlantic Avenue. It is here the beautiful Grecian-Doric style granite market building was constructed in 1825-26. Today the building is known as Faneuil Hall Marketplace. The domed assembly room at the center of the market was called Quincy Hall, and this led to the building being also known as Quincy Market. Samuel Adams Drake quoted Josiah Quincy himself as saying the market, "invested the sluggish town with new life, and brought into practical use a new watchword, "Progress." During Quincy's administration, six new streets were also laid out in this reclaimed area, as well as dock and wharf rights obtained. The future rents paid the $1 million dollar construction costs of the market building. Josiah Quincy was elected to the U.S. House of Representatives in 1805, and was one of the first to denounce slavery. He was also President of Harvard University from 1829 to 1845. Quincy wrote several books including The Municipal History of the Town of Boston, The History of Harvard University, A Memoir of the Life of John Quincy Adams, and The Journal of Mayor Samuel Shaw. He also served in the Massachusetts State Senate, and as a municipal judge. 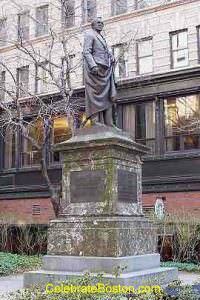 The Josiah Quincy Statue was sculpted by Thomas Ball, and erected in 1879. 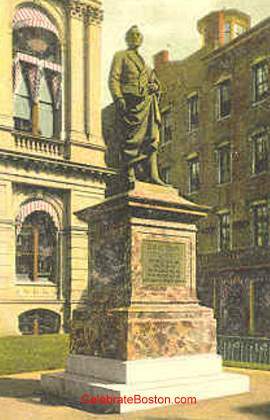 The statue rests in front of Boston's beautiful Old City Hall building, opposite the Benjamin Franklin Statue.